The Nano seats four, and the basic model has no power steering, air bags, radio, or air conditioner. Oh yeah, and instead of welding the plastic and sheet-metal parts of the exterior are joined with adhesives: a glued-together car. 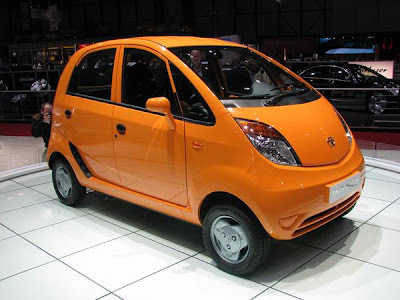 The Nano has a maximum speed of 70 kilometers per hour... or 43 miles per hour. This thing would get eaten alive by most of the roads around where I live. Volkswagen . . . re-engineered for the 21st Century. I once had a crazy uncle who drove around in a Gremlin. And I used to tell him that his tiny lil' car would be toast if he ever got hit by anything.